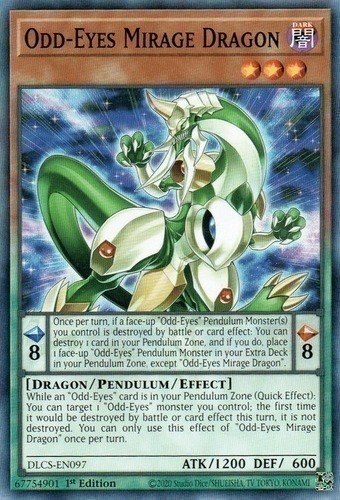 Text Pendulum Effect: Once per turn, if a face-up "Odd-Eyes" Pendulum Monster(s) you control is destroyed by battle or card effect: You can destroy 1 card in your Pendulum Zone, and if you do, place 1 face-up "Odd-Eyes" Pendulum Monster in your Extra Deck in your Pendulum Zone, except "Odd-Eyes Mirage Dragon". Monster Effect: While an "Odd-Eyes" card is in your Pendulum Zone (Quick Effect): You can target 1 "Odd-Eyes" monster you control; the first time it would be destroyed by battle or card effect this turn, it is not destroyed. You can only use this effect of "Odd-Eyes Mirage Dragon" once per turn.